Microsoft acquired Datazen back in April 2015, and I explored it and wrote about it a couple months later. To date, Microsoft has mostly left the product as is, although a new version containing bug fixes and a few enhancements was released in September. For on-premises solutions, you will have one unified SSRS Report manager that supports mobile reports and interactive reports as well as paginated reports. And it’s much prettier than the old SSRS report manager! There will also be a unified mobile app so there is no need to switch between apps to get Datazen reports and Power BI reports. This new report manager means the current administration of Datazen (hubs and dashboard groups, etc.) will likely change to conform to more of the SSRS or Power BI paradigms. As far as I know, there aren’t yet solid details on exactly how this will work. In the Microsoft-led sessions at PASS Summit, they also mentioned that there will be migration tools for those already using Datazen that want to take advantage of this new platform. So if you are considering Datazen but were worried about its future, there is no need to worry. If you are implementing Datazen now, you can feel better about enhancement and upgrade opportunities with the promised migration tool. You can get the ebook here for free! We plan on updating it as more information comes out on Datazen and SQL Server 2016. What’s The Deal With Datazen? I’ve been exploring Datazen for the last several weeks, and I’ve had the opportunity to discuss it with some clients. While it doesn’t do everything everyone wants it to, I think it fills some feature gaps in the MSBI mobile story. Datazen was initially released in 2013 and gained popularity and many positive reviews. Microsoft announced the acquisition of Datazen on April 14, 2015. That announcement included the statement that SQL Server Enterprise Edition customers with version 2008 or later and Software Assurance are entitled to download the Datazen Server software for free. So many organizations just got a free mobile BI tool (not counting the cost of up set up, adoption, and maintenance). Microsoft has stated that they will be integrating some Datazen technology into SQL Server 2016 and Power BI, but the current version of Datazen could be useful depending on an organization’s needs. Activity Stream, maps, scorecard. I hate round dial gauges. I didn’t build this. It’s just a demo sample. Mobile BI: Datazen has feature parity on iOS, Android, and Windows 8. The native apps are optimized for touch gestures and offer useful features such as client-side caching for offline viewing. Maps: There are 70 built-in maps at the state, country and region level. You can also create custom maps using ESRI shapefiles. Activity Streams: Users can add comments with contextual information and interpretations of the numbers for other users to view. Integration into current environment: Datazen allows the use of Active Directory or ADFS for authentication. Datazen can be embedded into SharePoint or custom web apps through an iframe. It also supports custom branding. Security: Datazen encrypts data on the server, while in transit, and on client devices. Application pin locks are supported on all mobile clients. For more information on these features, see my video on the BlueGranite site or the Datazen website. Datazen product elements include Datazen Server (control panel, authentication, data sources and views, dashboard and KPI storage), publisher app, and viewer apps. Where Does Datazen Fit in the MSBI Stack? Microsoft already has Power BI, which has mobile apps (in the new 2.0 version) for Windows and iOS, with an Android app coming soon. Yes, Datazen adds another tool to an already confusing array of options in the MSBI stack. But the scope and strengths of Power BI are rather different from those of Datazen. 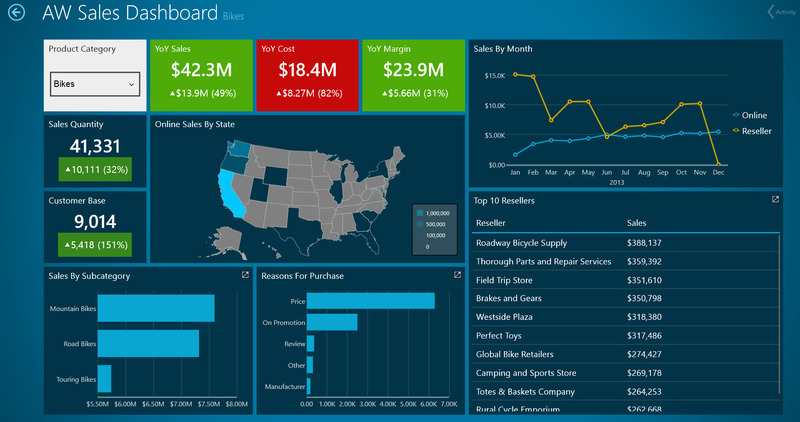 Power BI is a good data discovery and self-service BI tool. Datazen doesn’t really do data discovery; it’s more for structured analysis. Organizations that use Android devices, or those who need enterprise-mobile BI access now may look to Datazen (especially if they get the license at no additional cost). Organizations who are not ready to house their data in the cloud, don’t want to deal with the change management of constant updates in Power BI, or those with strong mobile security concerns may also consider Datazen. Datazen is good for dashboards with defined drill-through paths. This is a similar paradigm to Reporting Services. You create the charts and navigators/filters and then define the drill-through destination to access when a user touches/clicks on a chart, passing the location of another dashboard or a custom url along with any parameters. Datazen also allows you to create KPIs that can then be pinned to the start menu in Windows 8+ as a live tile. This is good if you have just a few KPIs that you want to monitor at a glance. without opening an app or website. The best part of Datazen is that it just works on mobile devices without the developer having to do much of anything special to provide a good mobile experience. And the viewing/interactivity capabilities are the same whether you are on a laptop, phone, or tablet. Datazen isn’t a data manipulation tool like Power Query or a sophisticated calculation engine like Power Pivot. You must feed your data into Datazen in a very particular way to make the charts you want. It can do simple aggregates like sums and counts and calculate the difference between results and goals in a KPI, but that is about it. Any other calculations must be done in the data view (source query). This isn’t so much a criticism as a statement. I can appreciate that Datazen isn’t trying to be all things to all users but instead chose to focus on a few things (mobile dashboards, rapid dashboard development) and do them well. While Datazen dashboards could be built by a data savvy business user, I don’t consider it to really be self-service BI. It’s more likely that BI developers and analysts will use it (similar to Report Builder) to build static but refreshable dashboards with the ability to filter data and drill through to more detail. You must publish the dashboard in order to use it or share it with others. I firmly believe that there is still a place for these kinds of reports and dashboards. They can ensure consistent measurement and analysis, and keep important metrics easily available to those who need them. 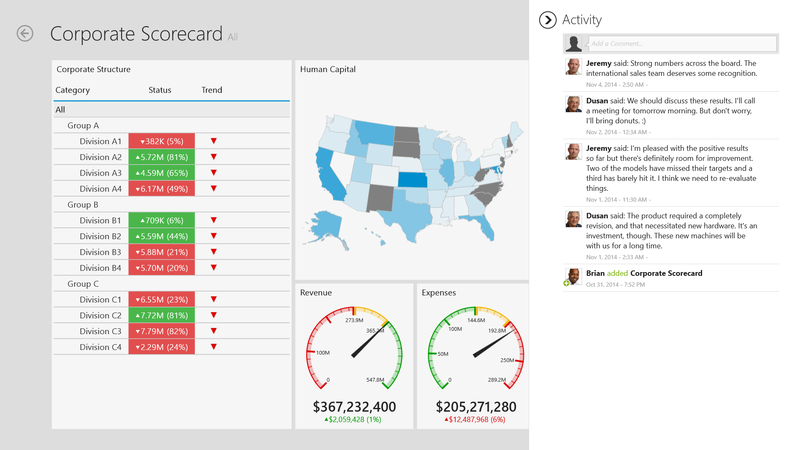 Unless you live in SSRS, Datazen dashboards are quicker and easier to build than SSRS dashboards. Datazen keeps things simple with a grid system for easy alignment and color palettes and background options that are similar to Power View. You can’t change Datazen dashboards (switch chart types, move graphs around, etc.) on the fly directly from a mobile device. The only way to update a dashboard is to use the publisher app which is available only on Windows 8 laptops/tablets. Another question I’ve been asked is whether the charts inside a dashboard are reusable. As far as I know, there isn’t a way to reuse a chart from one dashboard in another dashboard, unless you want to create a dashboard that contains just the chart and make it a drillthrough destination in multiple dashboards. When you build a dashboard, you build the master view first. This is the view you see from your desktop in the viewer app or on the website. Then you build the tablet and phone views by placing the existing charts onto the grid in a different configuration to fit the format. You can reuse a chart that you built on the master view in the phone or tablet view (any chart you want to use must be built on the master view). But you can’t use that chart in a completely separate dashboard. Datazen also isn’t an SSRS replacement. SSRS has features such as alerts, subscriptions, printing, exporting, etc. that are not available in Datazen. SSRS also allows more fine-grained control of colors and formatting and has a robust expression language for calculations. Datazen has a place in the MSBI family. Although it does have some overlap with existing MSBI tools, it also brings some capabilities that were missing. My impression is that it is a good solution for mobile BI when data exploration features are not needed. It’s fairly easy to set up and doesn’t take much time to publish a decent dashboard. More time will likely be spent with data preparation than it would with other tools. Right now, Datazen enhances Microsoft’s mobile capabilities and complements Power BI’s features. There will be some organizations that use only Datazen or only Power BI and others that may opt to use both. It’s all about using the right tool for the job. A demo dashboard that I made. Notice there are no round gauges. There are several great blog posts out there on Datazen. Here are a handful that I found informative. I will be speaking at two SQL Saturdays in April. First, I will be at SQLSaturday #297 in Colorado Springs on April 12. I’ll be presenting my session on The Accidental Report Designer: Data Visualization Best Practices in SSRS. See my previous post on this subject to understand why I think it is an important message for all data professionals. In this session, I share guidance on evaluating the effectiveness of data visualizations and a few good tips and demos to take your data visualizations from chaotic and ineffective to professional and powerful. You have geospatial data and you know that plotting it on a map will deliver insights. Or maybe you keep hearing “geospatial” as a current BI buzzword and you want to be informed about your options when you get to it. The Microsoft BI stack provides several options for visualizing location data. But how do you know which tool will best serve your purpose, or what factors are important in making this decision? We’ll identify factors to consider when choosing a tool to visualize your data in maps such as system requirements, availability and type of location data, required level of technical understanding, and more. You’ll leave the session confident in your ability to choose the best tool within Excel and SQL Server. The Microsoft BI stack offers several great options for presenting data on a map, but your decision of which tool (Power View Map, Power Map, SSRS map, free mapping apps in Excel) can limit you in features, accessibility, and time to delivery. Some of the tools require more technical skill than others, but you lose some of the ability to customize when you go with the highest ease of use. The session will be filled with tips, explanations of features and requirements, and demos. If you will be in the area on the dates of these events, please stop by to participate in my sessions or just say hello. I’m passionate about data visualization. Data professionals work so hard to gather, integrate, cleanse, aggregate, and deliver data to users. Creating a good report turns that data into actionable information, taking it the last mile. Consequences of bad report design range from failure to provide appropriate business insights to misleading users and causing them to draw incorrect conclusions. As much as I enjoy my job as a data professional, my job does not exist simply for my enjoyment. My goal is to create solutions that provide timely, accurate, usable information to ultimately help businesses cut costs or create new revenue. I’m missing the mark if I allow poor report design to jeopardize my efforts. When I began learning data visualization best practices, I felt like my eyes had been opened to a facet of my work that I had been unintentionally ignoring. I realized I had been making several common mistakes simply because I did not understand the user experience I was providing through my design choices. If you are a developer, it is important to realize that reports/dashboards/data visualizations require as much planning and thoughtfulness as any other user interface design. It is not enough to slap the graph on the page and move on. When you make an SSRS report with a non-white background, you may initially notice some white around the edges of the report. This MSDN forum post helped explain why this occurs. 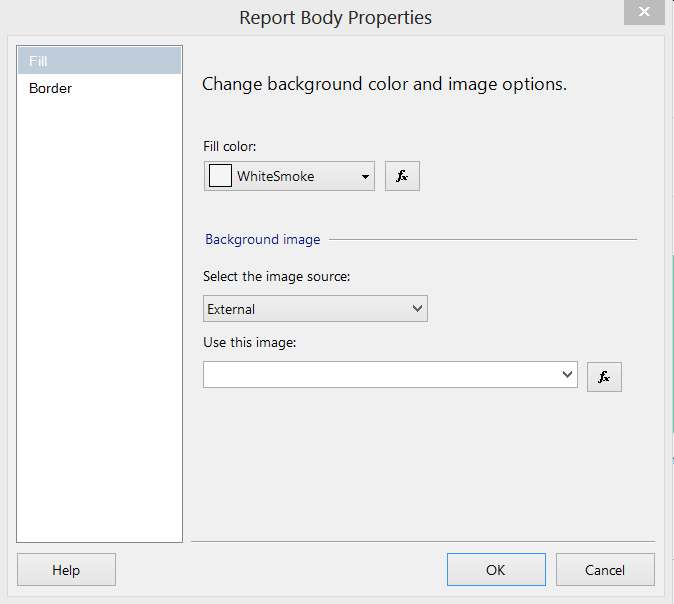 When you set the background color property on the report body through the wizard-like UI (shown below), you are setting the background color of the report body only. In my example, I have chosen the color WhiteSmoke to provide a light gray background and remove the harshness of the plain white. There is another property you must set for the entire background around the report to be the same color. You can access it in the report properties grid (select the report and hit F4). 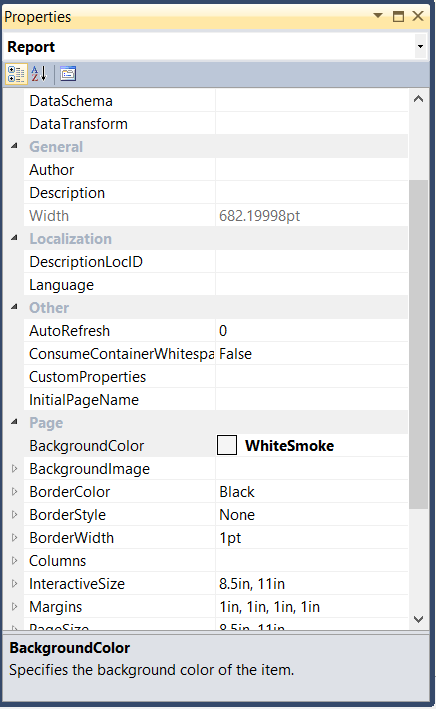 Once I change the BackgroundColor property on the report under the Page group to WhiteSmoke, I get a complete background of light gray. The white around the sides is gone. I need to get some chores done, but instead I am cleaning up my bookmarks and re-reading bookmarked articles. Hopefully this is beneficial for you, since you now get to have a small collection of useful links. These are just a small sample of articles that I find myself going back to either for my own reference or to send to a client or colleague.